Maybe your child already has plans to be the next J. K. Rowling, keenly writing away at their desk every day, or perhaps your child is a reluctant writer, not wanting to complete their social studies journal assignment. 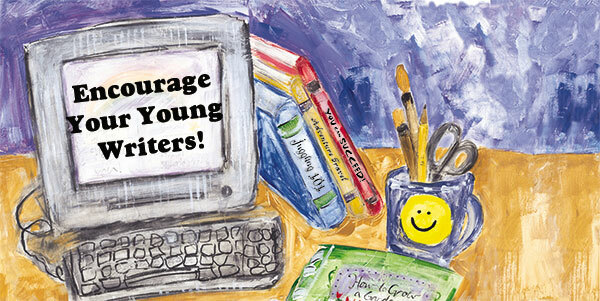 Either way, it's Encourage a Young Writer Day and we have something to celebrate! We have some tips and ideas to help your child bloom into an eager writer or expand and grow their love for writing and reading they already have. • Read, and read often. • Read with a pen and notebook nearby. • Write, and write often. • Write about passions, experiences, real life (or imaginary life works too!). • Write from the heart. • Follow your curious mind. • Learn form and structure first. • Use family and friends to find character inspiration. • Be observant. Bring a notebook wherever you go, writing down notes or interesting things that could later make it into a story, poem, or essay. • Be daring with your words. Keep an interesting word log and record new words you come across—words you don't know or words you don't use very often. Other books you're reading or listening to others' conversations are great ways to collect interesting words or tidbits. • Make writing/journaling dates together. Go to a special local spot to grab a hot chocolate or smoothie, and bring your pens or pencils, journals or laptops. Write about what you observe, or how the smoothie tastes, or what you're most looking forward to over the summer. Writing by hand is always helpful for younger writers and readers, but if typing on a computer is more inspiring for him or her—let them go for it. • Encourage your child to share their work with you. Make sure you find three or four things to praise, and one suggestion to improve their work. It can be a school piece or something fun your child did at home. • Read together daily, as part of your routine. Or, if your child is older, check in and make sure your child is open to reading for leisure. Of course you can, and should, still read together too! • When you're reading together, ask your child to point out his or her favorite words, or words her or she doesn't know. Write them down in a journal, and look them up together. Later your child will have an entire well of word possibilities when feeling stumped. • Celebrate your child's imagination, always encouraging them to unleash their wildest thoughts and stories. Who knows—it could be the next Alice's Adventures in Wonderland or James and the Giant Peach! • Be as encouraging as possible, offering your child affirmation and positive reinforcement in their creative work. • Make lists. Start with simple topics, like "10 things that remind you of spring" or "Five of your favorite animals." Then, see how your child can incorporate these ideas into a story, essay, or poem. Remember, they can be as imaginative as they'd like! • Use artwork, pictures, or photos for inspiration. You can even see if your child would rather draw a picture first before writing. Then they can use that drawing to create a story. Hint: These make great character or setting sketches! • Write a how-to piece. Let your child choose write about what their favorite thing to make, do, or practice is. For example, if she loves to ride bikes with friends, let her see if she can put together interesting directions on how to ride a bike. (It's harder than you probably think!) This allows the writer to really strip down their writing technique and get to the core of their writing. It's just a great way to practice simplifying your writing. • Make an "I Remember" collage. This exercise is inspired by author Joe Brainard, who wrote a collection of memories using "I Remember" at the start of each recollection. You should definitely do one too! Then, come together and read them out loud. You'll even sense a poem unfolding as you read/write these. Check out Second Story Window for some fun, prompted writing activities for kids, including workbooks, worksheets, etc. For example, find writing activities and crafts for each month of the year here. Reading & Writing Readiness Pinterest board has some great resources for kids' writing and storytelling activities as well. Hooray for You! is the perfect gift to show someone how special they really are. What better way to celebrate a child's unique traits than by giving them a personalized book made just for them?